Plants dark green, erect, a few to up to 40 cm tall, comprising numerous erect axes arising from a base of entangled branching rhizoids. Thallus organization acropetal, intercalary cell divisions rare, laterals cut off (usually from the subapical cell) via an oblique wall that in older parts of the thallus moves into a transverse position. Usually not more than two laterals per cell. Terminal branch systems often standing out as rather separate from lower axes as older cells elongate. Apical cells 150-200 µm in diameter, about 4-8 times as long as broad, cylindrical with rounded apices. Proximal cells of erect axes up to 600 µm in diameter and 15 (-40) mm long, cylindrical or slightly dilated at distal end. 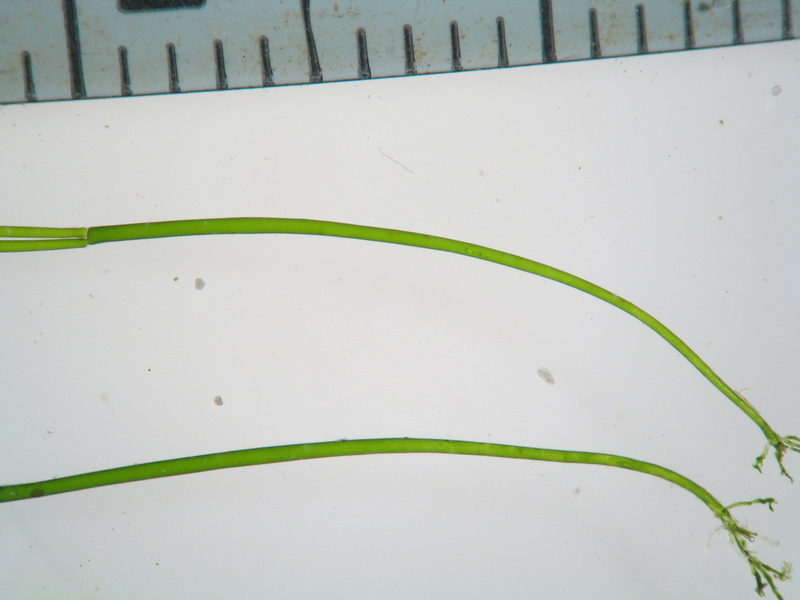 In fertile plants terminal branches becoming elongate, unbranched, with relatively short cells. Description from Stegenga et al. (1997). Recorded from Table Bay eastward to Durban (15-51). 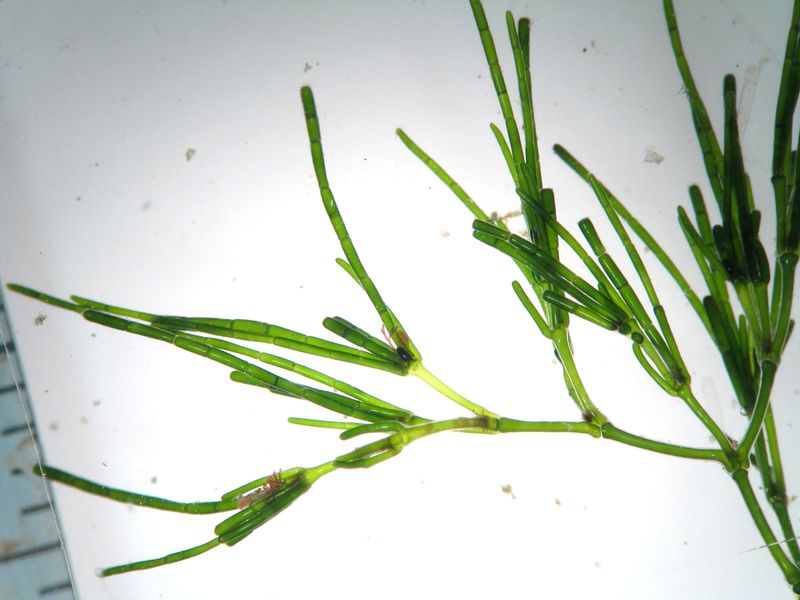 Epilithic in the lower eulittoral and sublittoral; intertidal and sublittoral fringe plants are usually shorter (to about 15 cm). Smaller plants can form rather bushy tufts or turfs. World distribution: Also recorded from Gough Island (South Atlantic) and India (Guiry & Guiry 2012). Type locality: Algoa Bay, Cape Province, South Africa (Silva et al. 1996). Note: According to Wynne (2017), this species should be called Lychaete radiosa (Suhr) MJ Wynne. Cladophora radiosa, detail of distal branching (scale divisions 1 mm). Cladophora radiosa, detail of elongated basal cell (scale divisions 1 mm). Cladophora radiosa, . 1, Habit. 2, Detail of thallus apex. Drawing reproduced from Stegenga et al. (1997). Guiry, M.D. & Guiry, G.M. 2012. AlgaeBase. World-wide electronic publication, National University of Ireland, Galway. 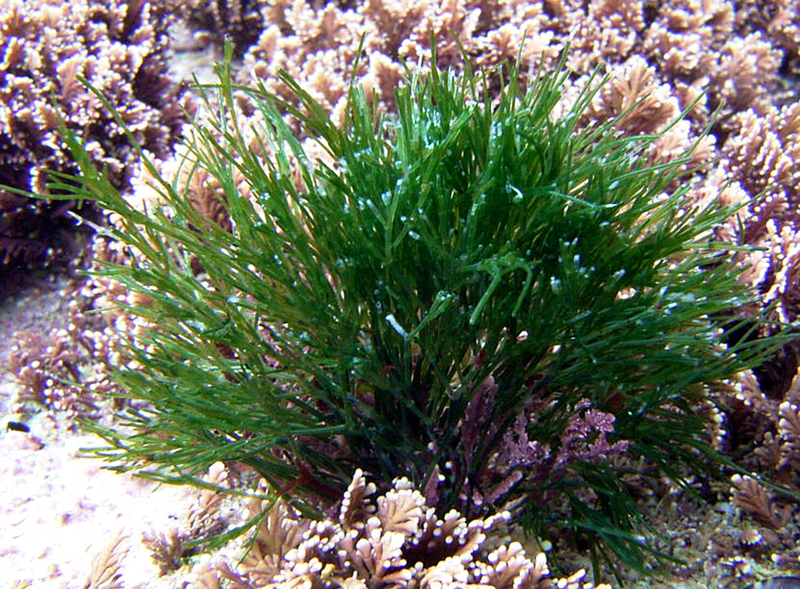 http://www.algaebase.org; searched July 2012. Stegenga, H., Bolton, J.J. and R. J. Anderson. 1997. Seaweeds of the South African west coast. Contributions from the Bolus Herbarium 18: 640 pp.